Our FAQ will help you to find the answers to most of your queries. It will be regularly updated according to your questions and needs. If you did not find an answer to your question(s), please feel free to contact our after-sales service. We will reply as soon as we can. Can an electric water heater be installed in a kitchen? Can I install my water heater in the bathroom? A water heater can be installed in a bathroom in certains conditions – position and protection of the appliance. 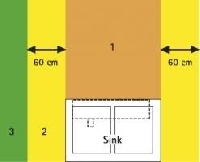 The positioning criteria can vary according to the country but, in general, 4 areas are distinguished in a bathroom (see the drawing below). The appliance’s protection level is defined by its IP code. All Atlantic water heaters are IP 24 or IP 25 and can be installed in volumes 1, 2 and 3. What must I do if I have steam coming from my tap? Switch off the current and get a professional to check your appliance. What must I do if my water heater is losing a large amount of water through the safety valve? Check the pressure of your water supply. If this pressure is greater than that of the opening of the safety mechanism, it will remain open (which is normal). Get a pressure reducer fitted to the cold water supply for your home, which will also protect the other appliances in the house that use water and protect your pipes from too great a pressure. Is it normal for my water heater to drip at the safety valve? This a normal physical phenomenon. As the water heats up, it wants to increase in volume, but it cannot do so and the pressure increases in the tank. In order to prevent the pressure from rising to a hazardous point, the safety mechanism allows a small quantity of water to escape (2 to 3% of the water heater’s volume). This ensures your safety. This flow is normally connected to the drain. Is it normal for my water to make some noise? This can be normal. A water heater equipped with a sheathed heating element can indeed make a slight bubbling noise. People vary in their sensitivity to this noise. These phenomena occur more rarely with a ceramic resistance water heater. A product placed in a cupboard can amplify this slight noise, often noted for products that operate on a night rate and that occur when the home is particularly silent. The noise can also come from scale in the water heater; in this case, clean it by removing the scale without scraping the walls and remember to change the seal of the closure flap. Is it normal that I have no hot water on the first installation? The electric water heater requires a heating time that varies from 20 minutes for the smallest to 6/8 hours for the largest. You must wait for this time to obtain hot water. Some models have an indicator light that shows you if the product is in a heating period. You can check whether the water heater is receiving current. Important note: This is a professional operation and you must have the required skills. Next, after removing the power, you can use an ohmmeter to check whether the heating element and control thermostat are working. Check on the thermostat that the safety mechanism has been reset. If you still have no hot water, call in a professional or the after-sales service. What is the warranty period for my water heater? The warranty period is decided on at a local level and depends on the country of purchase. Your dealer will be able to provide you with this information. It depends on the type of water, the use (temperature, quantity of water used) and the quality of the appliance: between 2 and … 20 years! The average for our brand is above 12 years. What is the best location for water heaters? It depends on your taste. In a discreet place (cupboard) or directly in bathrooms. Think about leaving enough space around electrical parts for maintenance operations. How do I install my water heater? Refer to the instruction manual. Depending on the country, local regulations impose specific installation rules. What must be done if the house is not occupied? For extended absences (1 month), switch off the power to the appliance and drain down the water heater to prevent any risk of frost damage. How do I choose the capacity of my water heater? The water heater capacity is chosen according to the number of users, their water consumption habits and the facilities of the house (bath, shower, etc.) and the electrical supply (continuous connection or night rate). For the best comfort levels, a 50 l water capacity at 65°C per person per day is usually recommended (i.e. for a family of 4 people = a 150 L water heater). This value can be reduced to 35 litres for a more economical use (shower instead of baths for instance). What water heater model should I choose? Depending on whether the water heater is designed to be mounted in a cupboard, to be surrounded by shelves or to be integrated into a back kitchen, a choice must be made between horizontal, vertical, wall-mounted or floor standing models. What type of heating element should I choose for my water heater? We recommend choosing the immersion or stéatite-protected type depending on the type of water that the water heater will use. For aggressive or hard water, we recommend the stéatite heating element (protected by a sleeve).